Pascal Guyot, AFP | Protesters stand amid tear gas smoke during an anti-government demonstration called by the Yellow Vest movement in Toulouse on February 23, 2019. France’s Yellow Vest protesters take to the streets on Saturday for a 22nd consecutive weekend of demonstrations. 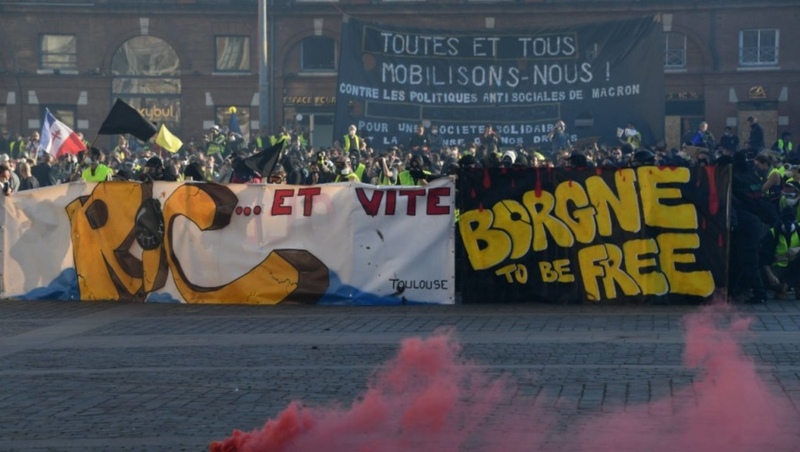 They have named Toulouse the “capital” of this edition, the first since a controversial anti-rioting law took effect on Thursday. Prime MinisterÉdouard Philippe on Monday presented the initial findings of a vast, nearly three-month-long public consultation known as the Grand Débat. Macron launched the initiative in January in response to the Yellow Vest unrest saying he “intend[ed] to transform violence into solutions”. The new anti-rioting law, which was partially censured by the country’s Constitutional Council before taking effect and which has been condemned by dozens of organisations, makes it illegal to cover one’s face during demonstrations. Last week, “Act 21” of the protests drew 22,300 people into the streets, the Interior Ministry said, the lowest official figure since the demonstrations began in mid-November. Saturday’s showing is due to serve as merely a foretaste to larger demonstrations slated for April 20, with Macron expected to present his response to the nationwide debate in a speech in the interim.